Tracey CostescuCommission Portraits & Original Artwork: My New Toys! That is just about the most beautiful thing I've ever seen! 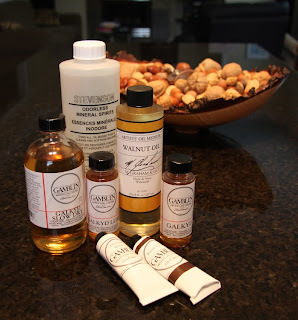 :) I also chose to go with Gamblin since Opus carries it, but I also discovered M Graham (I see you have a bottle of their walnut oil, which Opus does carry but not the paint!) and just LOVE it. But, since its base is walnut oil, it takes a lot longer to dry. Still worth it. Yes I have heard alot and wish I had seen the M Graham alkyd as it is supposedly totally non-toxic.